As graphene is expensive and relatively hard to produce, great efforts are made to find effective yet inexpensive ways to make and use graphene derivatives or related materials. Graphene oxide (GO) is one of those materials - it is a single-atomic layered material, made by the powerful oxidation of graphite, which is cheap and abundant. Graphene oxide is an oxidized form of graphene, laced with oxygen-containing groups. It is considered easy to process since it is dispersible in water (and other solvents), and it can even be used to make graphene. Graphene oxide is not a good conductor, but processes exist to augment its properties. It is commonly sold in powder form, dispersed, or as a coating on substrates. Graphene oxide is synthesized using four basic methods: Staudenmaier, Hofmann, Brodie and Hummers. Many variations of these methods exist, with improvements constantly being explored to achieve better results and cheaper processes. 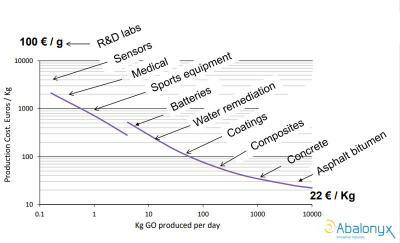 The effectiveness of an oxidation process is often evaluated by the carbon/oxygen ratios of the graphene oxide. 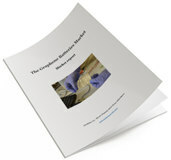 Graphene Oxide films can be deposited on essentially any substrate, and later converted into a conductor. This is why GO is especially fit for use in the production of transparent conductive films, like the ones used for flexible electronics, solar cells, chemical sensors and more. GO is even studied as a tin-oxide (ITO) replacement in batteries and touch screens. Graphene Oxide has a high surface area, and so it can be fit for use as electrode material for batteries, capacitors and solar cells. 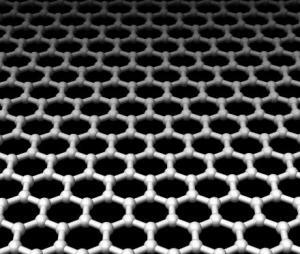 Graphene Oxide is cheaper and easier to manufacture than graphene, and so may enter mass production and use sooner. GO can easily be mixed with different polymers and other materials, and enhance properties of composite materials like tensile strength, elasticity, conductivity and more. In solid form, Graphene Oxide flakes attach one to another to form thin and stable flat structures that can be folded, wrinkled, and stretched. Such Graphene Oxide structures can be used for applications like hydrogen storage, ion conductors and nanofiltration membranes. Graphene oxide is fluorescent, which makes it especially appropriate for various medical applications. bio-sensing and disease detection, drug-carriers and antibacterial materials are just some of the possibilities GO holds for the biomedical field. 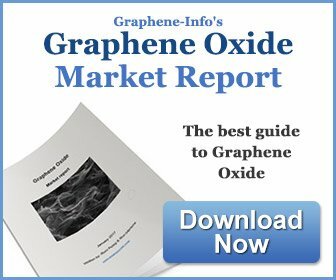 Graphene oxide is relatively affordable and easy to find, with many companies that sell it. It does, however, get confusing since different companies offer products that vary in quality, price, form and more - making the choice of a specific product challenging. If you are interested in buying GO, contact Graphene-Info for advisement on the right GO for your exact needs!